This hike took a group of 34 Smoky Mountains Hiking Club hikers through part of the South Knox Historic Corridor: Fort Dickerson, Armstrong Hill and the River Bluff areas, and Fort Higley. Participants enjoyed an unusually mild December day and the leisurely pace gave lots of time for contemplating the scenery, some nice and some not so nice. The views of Knoxville from the River Bluff area are great, and much of the route meandered through very nice woodlands. 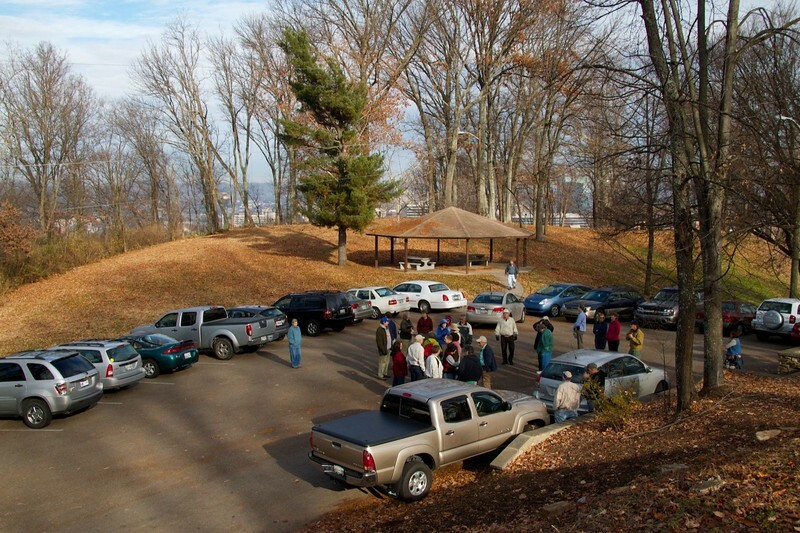 It was clear that this park concept has a lot to offer the people of Knoxville and Knox County and, when completed, will offer a wonderful hiking opportunity with interesting historical content. Much thanks to the hike leaders, Ed Fleming and Mark Shipley. We met at Fort Dickerson. Some of the cars were subsequently moved down to a lower parking area.